Ryan Lynch’s iDJ concept that we let you know about last week seems to have gone functional with Philips introducing FWP3200D DJ-Dock. While there are no perceivable resemblances aside from the form factor between them, the product ergonomics appear to be on somewhat similar lines. The DJ Dock comprises a combination speaker system and dual-deck docking station to appease party mongers with high quality, powerful music. The DJ-Dock has dedicated rotatable bays for accommodating two iPhones or iPads. Integrated lighting effects, which allow users to select either red, blue or purple glow, or an alternating combination, ensure that the contraption appeals visually to all. 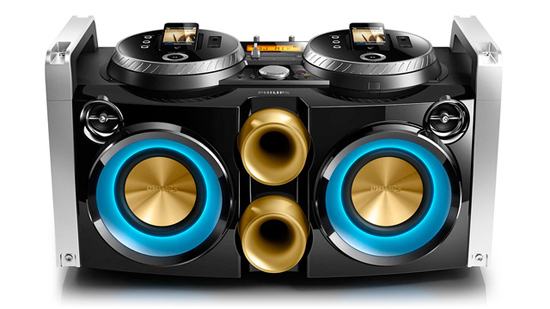 The all-in-one DJ has speaker system that includes a pair of 5.25-inch subwoofers and 2-inch tweeters. For connecting with non-Apple media players, it relies on USB, aux-in port and microphone input. Its compatibility with Algoriddim djay app offers advanced functionality for creating mixes and matching beats. 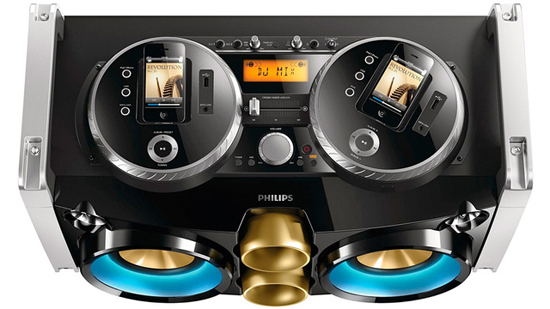 Priced at £299.99 ($470), the Philips FWP3200D DJ-Dock also has a channel fader, treble/bass controls, and a “power boosting” MAX Sound mode for delivering 300W amplification. If you wish to grab the FWP1000 speaker kit too, it’s available for £199.99 ($314).